1 photograph : b&w ; 11 x 14 in. 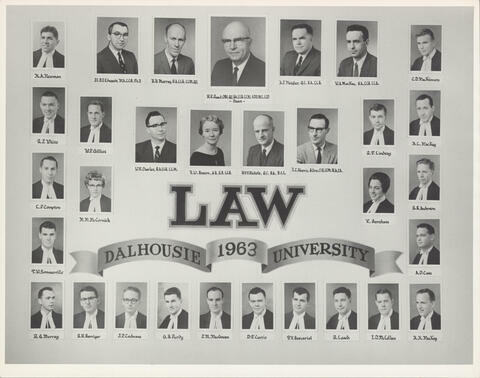 Item is a composite photograph of the 1963 graduating class and faculty of the Dalhousie University Faculty of Law. The photograph consists of portraits of H. A. Newman; R. J. 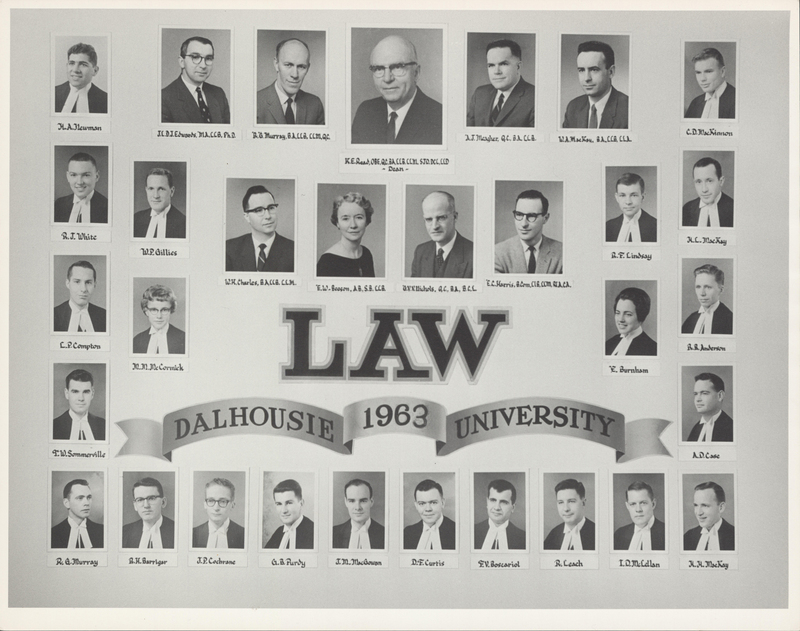 White; L. P. Compton; T. W. Sommerville; R. G. Murray; W. P. Gillies; M. M. McCormick; J. L. D. J. Edwards; R. G. Murray; K. E. Read (Dean); A. J. Meagher; W. A. MacKay; W. H. Charles; E. W. Beeson; G. V. V. Nichols; E. L. Harris; C. D. MacKinnon; H. L. MacKay; R. F. Lindsay; E. Burnham; R. R. Anderson; A. D. Case; R. H. Barrigar; J. P. Cochrane; G. B. Purdy; J. M. MacGowan; D. F. Curtis; F. V. Boscariol; R. Leach; I. D. McLellan; and H. H. MacKay arranged in several rows around a banner.